OTTAWA, CANADA - Eurocom Corporation will be launching at the cdXpo show in Las Vegas on November 17-20, 2003 the latest line of its high-end mobile engineering workstations based on OpenGL technology and supporting such features as RAID fault tolerance disk mirroring, high speed 1 GB LAN and wireless networking, fast processing and superior multimedia. Perfect Mobile Engineering Workstation and/or Mobile Gaming Machine for demanding expert user with with 256 MB DDR video and ATI Mobility Radeon 9600 FireGL on-board. The only notebook on the market capable of running CAD and 3D modelling software demanding Open GL. Based on the Intel® Pentium® 4 processor FSB 800 MHz. Up to 2 GB of DDR400 memory. Modular design, capable to support two concurrent optical drives (i.e. DVD-burner and DVD-ROM) and up to two physical hard drives (up to 7,200rpm). High speed 1 Gigabit LAN on-board standard along with optional 11Mbps 802.11b and 54Mbps 802.11b/g wireless LAN. Incredible 15-inch QXGA Active Matrix LCD with resolution of 2048-by-1536 pixels or 15-inch UXGA 1600x1200. A Mobile Workstation with 17-inch mega-wide WUXGA widescreen designed to support Intel Prescott Pentium 4 processors FSB800 with 1MB of cache. Standard 256 MB DDR video powered by ATI Mobility Radeon 9600 Pro and soon by the ATI Mobility Radeon 9600 FireGL graphics engine. Up to 2 GB of DDR400 memory. Standared 1 Gig LAN on board and optional 802.11b and Bluetooth. Supports 64-bit wide DDR400 data channels and RAID 0, RAID 1 HDD Fault-Tolerance System and up to 160 GB of HDD space with two physical hard drives (5,400 or 7,200 rpm). Standard 1.3 mega pixel Video Camera for Video Conferencing, internal 7-in-1 Flash Card Reader exchangeable with optional TV-tuner with one S-Video input jack and one line-in jack for audio input. Standard DVD-I Port for external digital monitors. Full size 102-key desktop like keyboard and internal subwoofer. Superior multimedia performance. The updated version of the 17-inch D470W Impressa model. 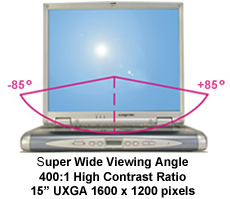 Featuring the largest, most spectacular widescreen WXGA 1440-by-900 resolution display with a 16:9 aspect ratio. Four built-in speakers and internal Sub-Woofer with surround sound for portable home theatre experience. Internal CCD camera and a standard 6-in-1 card reader. Powered by high performance Intel Pentium 4 processor up to 3.2 GHz with Hyper-Treading Technology FSB800 and superb graphics performance engine based on ATI Mobility Radeon 9600 with 128 MB of DDR video. True pleasure of portable computing and portable entertainment. The first fully customized tablet PC and notebook in-one based on the Intel Pentium M "Centrino" processor, standard 2.5" notebook hard drive and standard 200-pin DDR333 DRAM featuring the largest 14.1-inch rotating touch screen XGA display, integrated wireless LAN (11Mbps 802.11b or 54Mbps 802.11b/g) and FireWire, and a built-in PC Camera for Video Conferencing. Equipped with hand-writing recognition applications for marketing surveys, sales orders or taking notes, the T200C Convertible is designed for all-day-computing, anywhere, anytime with up to 6-hours of battery time. Eurocom will be located in the Canadian Pavillion of the Mandalay Bay Convention Center, LEVEL 2, in Booth #2030. To download your free tickets to the cdXpo, follow this link to save and print off the ticket. Eurocom Corporation can be reached in Las Vegas by calling Ryan Valley at: (613) 878-4844.